WWI came to be known as the ‘War to End All Wars', though alas this didn't turn out to be true. Germany declared war on 4 August 1914, and its von Schlieffen Plan called for a swift and decisive strike through Belgium and northern France to encircle Paris. Unfortunately, due to sales rights restrictions, we cannot offer 6529: German Soldier On The Western Front 1914-1918 for sale in your country. WWI came to be known as the ‘War to End All Wars’, though alas this didn’t turn out to be true. Germany declared war on 4 August 1914, and its von Schlieffen Plan called for a swift and decisive strike through Belgium and northern France to encircle Paris. Of course, things didn’t turn out this way and German forces weren’t able to breach the Marne River. Faced by stiff French and British resistance, the initial attack was halted and the tide turned. The conflict bogged down into static warfare and France was soon crisscrossed by trenches as troops dug in for protection. Trench warfare wasn’t a new phenomenon, but in WWI trench and defence systems almost became a military art form. Hazards in this war included snipers, machine-gun and artillery fire, disease, ‘trench foot’ and even poison gas. 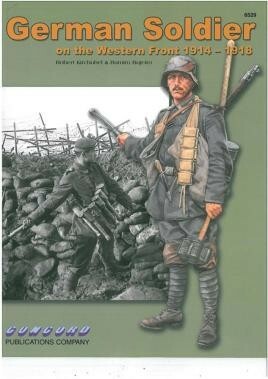 This new book in Concord’s Warrior series examines the German soldier as he fought in the Great War. The content spans the whole duration of conflict, from 1914-18. German soldiers are shown in a series of black and white photographs printed on high-quality paper. A whole range of uniform types and variations, plus personal equipment, are on display. A wide variety of weapon such as the Kar 98 rifle and MG08 are illustrated in these period photos too. Of course, the type of terrain that the soldiers fought in is also much in evidence, and gives an indication of the terrible conditions that personnel had to endure amidst the trenches and wire entanglements. Each photo is accompanied by a well-detailed caption that highlights pertinent points. This volume opens with a detailed description of WWI, with an emphasis on the trench warfare that characterized most of the Western Front fighting. The central four pages also depict colour plates by artist Ramiro Bujeiro. These show German soldiers in typical uniforms and personal gear from 1914, 1916, 1917 and 1918, thus offering a good selection for reference.